Long established Hyundai Dealer, HES Enterprises have been working successfully in partnership with Strickland MFG since 2011. HES, headed up by owner Andrew Shaw, attribute the success of this partnership to the good working relationship that has been built up between himself and his Key Account Manager, Nicola Troy. Pricing, availability and quick reaction times are vital when trying to close a deal, and Andrew is delighted that these requirements are met when he deals with Strickland’s. 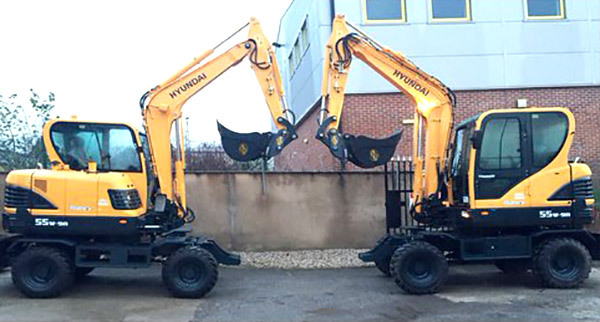 Selling the Hyundai range of machines from 1 ton upwards, Andrew has been successful in securing deals across the range. He has recently sold a Hyundai 480 machine to Kocurek, which is being fitted with a both a long and short reach arm. When the machine is being used with the short arm, Andrew opted to fit the machine with a Strickland S-LOCK coupler. The Strickland S-LOCK coupler is Andrew’s first choice of coupler when selling a machine. It’s simple mechanism and excellent in stock availability makes it an easy choice. “Working with Andrew is always a pleasure” says Nicola Troy, National Account Manager for Strickland MFG, “He knows his stuff and almost always converts his enquiries into orders. “Strickland look forward to many more successful years working in partnership with HES.